Since the launch of the first Landsat satellite in 1972, NASA’s observations of Earth from space have famously been used for charting trends in climate, land cover, weather patterns, and other Earth systems. The Space Agency has put countless downward-looking satellites into orbit to observe everything from ice and forest cover to ocean levels, soil and atmospheric moisture, gravity field fluctuations, and much more. But NASA’s many Earth-observing missions have another use as well: spotting events of interest, such as wildfires, in remote areas. 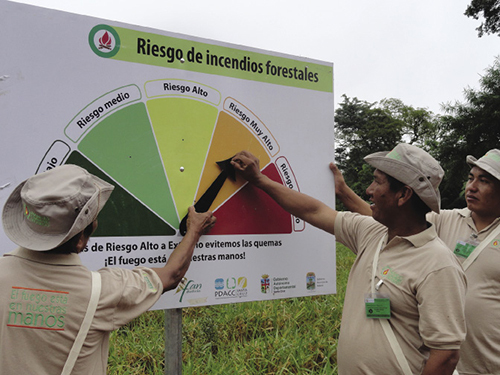 Members of the Friends of Nature Foundation in Bolivia adjust a fire risk indicator for the day. Daily and seasonal fire risks are among the products Conservation International’s Firecast system offers. With about two dozen satellites currently charting and recharting the planet’s 196.9 million square miles of surface, the Agency is constantly working to enhance software to manage that ever-growing mountain of data and find new ways to make use of it. In 2010, NASA launched the NASA Earth Exchange (NEX) project to leverage the supercomputing facility at Ames Research Center to enhance scientists’ ability to rapidly analyze nearly a petabyte of Earth-observation data. To ensure the information is used not only for research but also to achieve societal benefits, the Agency’s Applied Sciences Program, part of its Earth Science Division, supports partnerships through NASA’s annual Research Opportunities in Space and Earth Sciences (ROSES) solicitation. The program calls for proposals to use Earth-observation data and models to inform management, business, and policy decisions on several subjects, including wildfires and other natural disasters, with selected proposals funded through ROSES. Both ROSES and NEX have contributed to efforts by the nonprofit environmental organization Conservation International, based in Arlington, Virginia, to prevent deforestation and degradation from fires in tropical forests. In 2012, the organization was granted ROSES funding to overhaul and update its fire-monitoring and early warning systems and integrate data from recently launched NASA satellites. The organization’s fire-risk model had originated with a NASA grant about a decade earlier, and it would now benefit from an upgrade and expansion enabled by the climate data and supercomputing resources available through NEX. Using NEX to update fire-risk models and prototype and test the integration of data from additional NASA satellites, Conservation International developed an improved fire detection, monitoring, and risk forecasting system now known as Firecast. Karyn Tabor, Conservation International’s principal investigator for the upgrade, previously ran the organization’s fire-risk system, which in 2012 was only providing data for the Bolivian Amazon. The expansion to cover nine more countries would require computing resources the organization does not have in-house. Tabor already knew Forrest Melton, senior research scientist at California State University, Monterey Bay, as they had worked together before on an Applied Sciences Program proposal. The university is a partner in Ames’ 10-year Cooperative Agreement for Research in Earth Science and Technology with various Earth science institutions, and Melton was using NEX to map California’s Central Valley and determine the effects of drought on agriculture. He became a co-investigator on the Firecast project. “Our goal was to help Conservation International use the supercomputing resources and Earth-observation data available through the NASA Earth Exchange,” Melton says. “The issue when you’re developing a new model or application is that you can spend months pulling together and processing all the datasets.” NEX had more than 800 terabytes of data that Conservation International could use to develop and prototype its new fire-risk forecast model and decision support system. With far more computing and storage space than Conservation International had on its server, NEX let Tabor not only overhaul the fire-risk forecasting system but also expand it from Bolivia to include Colombia, Peru, Venezuela, Ecuador, Guyana, Suriname, Paraguay, Madagascar, and Indonesia. Conservation International has field offices in seven of the nine countries. Once the expanded prototype was developed and tested on NEX, it was moved to a production server on the Amazon Web Services Elastic Compute Cloud platform. In addition to daily fire-risk forecasts, the system also now incorporates seasonal risk forecasts for Peru and Bolivia from NASA’s Goddard Space Flight Center, calculated several months before the fire season, based on Atlantic Ocean surface temperatures. To augment the fire-alert system, which is still housed on Conservation International’s server, Melton also advised Tabor on systems for incorporating information generated by users on the ground via mobile devices. He had experimented with such systems to validate satellite information for his drought-impact mapping in California. “We were trying to figure out how we would use mobile devices to collect validation of fire alerts and enable access to a mobile platform for users to log patrolling information,” Tabor says. Smoke from forest fires in Indonesia can be seen in an aerial image from NASA’s Fire Information for Resource Management System. 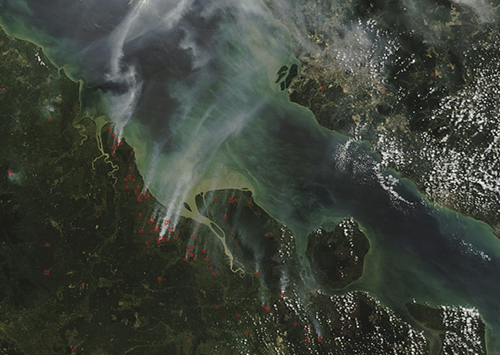 Conservation International’s Firecast system uses imagery and data from a number of NASA satellites for both spotting and forecasting rainforest wildfires. Satellite data is just one of NASA’s several contributions to the system. The team settled on the OnSight platform that GeoVisual Analytics, a company specializing in analysis of Earth-imaging data, had developed under two Small Business Innovation Research contracts with NASA’s Stennis Space Center. OnSight crowdsources information from users in the field, who can upload photos and other data about events they observe. The preexisting fire-risk and fire-alert systems were based on imaging data from NASA’s Moderate Resolution Imaging Spectroradiometers (MODIS) aboard the Agency’s Terra and Aqua satellites, as well as the Tropical Rainfall Measuring Mission, a joint NASA and the Japanese Aerospace Exploration Agency (JAXA) mission. As a result of the update, the fire-risk system also now incorporates data from the Ground Precipitation Mission, which flies on the Core Observatory satellite built by NASA and JAXA. In addition, the fire alerts include higher-resolution, higher-accuracy active fire detection from the Visible Infrared Imaging Radiometer Suite (VIIRS) on the Suomi National Polar-Orbiting Partnership weather satellite, a joint project between NASA and the National Oceanic and Atmospheric Administration. While the risk and alert systems remain on separate servers, they’re now accessed as a single Firecast product through a single website. “We always had these separate systems, but the key now is that there’s one website, and on the front end they look like they’re in the same place and target a broader user base,” Tabor says. The main purposes of Firecast are to spot and stop illegal activities like slash-and-burn operations in protected areas and to let people know when legal burning activities shouldn’t be carried out due to high fire risk. 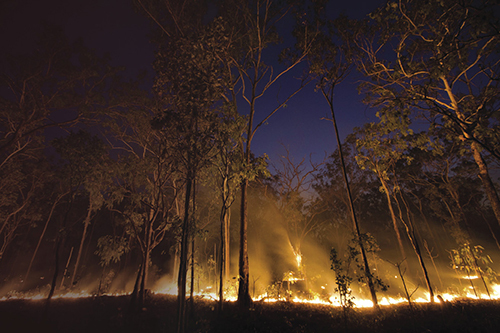 Tropical forest fires cause 7–12 percent of global greenhouse gas emissions, and fires are the main tool used to clear forests in the tropics. These biodiverse ecosystems are not only critical to mitigating global climate change, but they also provide essential resources for people, such as freshwater, food, and medicines, in addition to supplying habitat for the some of the most endangered species on Earth. Tabor says Firecast packages and delivers the information in a way that’s as useful and user-friendly as possible in each area it serves. Users—typically government offices, conservation groups, forest services, and academics—are asked what challenges they face and how they want to use the tool, and then data from locally trusted sources is presented in the local language, in the requested formats, and in the context of different areas’ historical data. “We build the system together with the end-users, so they have an invested interest in it,” Tabor says. Droughts, slash-and-burn operations, and even legal burning on risky days pose increasing fire risks to rainforests around the world. Conservation International’s Firecast system, enabled by a number of NASA partnerships, tries to minimize those risks. Tabor says a big part of the work is teaching people how to use Earth-observation data and where they can find it, whether through Firecast or elsewhere. Recently she has forged a partnership between Conservation International and NASA’s Applied Remote Sensing Training (ARSET) program to build the capacity of conservationists worldwide to use Earth-observation data and tools. Seasonal forecasts, which are produced annually, only recently became available to partner countries in South America, and Tabor says she hopes governments can use them to allocate money in advance for fire prevention and firefighting. In fall of 2015, Peru became the first country with the OnSight application as part of Firecast, although it didn’t go into use until the following summer, allowing users to upload and share information. 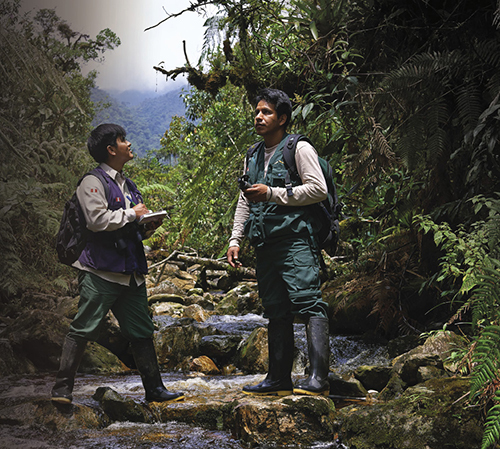 Managers of protected areas can use it to investigate fires and plan patrols. The application was rolled out in Madagascar in June 2016. Conservation International was already providing VIIRS data to leaders in Madagascar, and the larger Firecast program had launched there in summer of 2015.